A rally has been planned on Independence Day to support Bossier Sheriff Julian Whittington’s refusal to remove religion from the youth programs sponsored by the Bossier Sheriff’s Office. The 4th of July “In God We Trust” rally will be held Thursday from 1-4 p.m. at the Viking Drive Substation, 2510 Viking Drive, Bossier City. 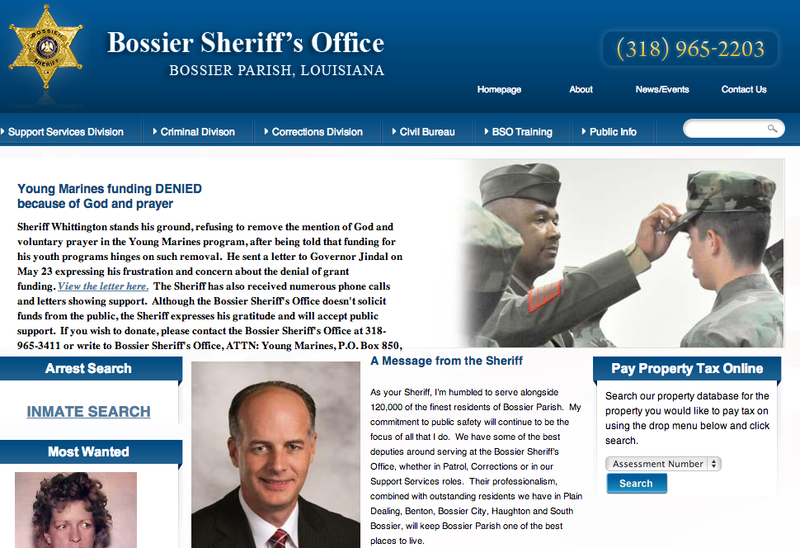 Bossier Sheriff Julian Whittington has taken a stand against the federal government for denying the Sheriff’s Office federal grant funding for their Young Marines and Youth Diversion programs worth $30,000, because of the mention of God and voluntary prayer in the programs. Sheriff Whittington received notice that funding would be restored only if he signed a letter “pledging that no prayer or mention of God would be allowed” in the programs. State Senator Barrow Peacock, R-Bossier City, has backed up Whittington’s decision, receiving unanimous Senate approval last month for Senate Resolution 192, which asks the Washington, D.C., delegation to review the basis for denying funds for the Bossier Parish Sheriff’s Office Young Marines Program. Whittington was recently featured on the national television program “Fox and Friends” discussing the denial of funding. And there has been a very strong local outcry against the denial of funding for the successful programs. The BSO is forging ahead with the programs, paying for them out of the department. As of the start of this week, the sheriff’s office had received approximately $2,500 in donations to support the programs.